Investigators head to Stephenville, Texas, after residents confirm sightings. UFO investigators, flock to Stephenville, Texas! A team of six investigators from the Mutual UFO Network will be interviewing citizens of Stephenville, Texas, who say they spotted a UFO at sunset on Jan. 8. The Mutual UFO Network is a nongovernmental group interested in documenting UFOs. State director Ken Cherry says that the network has received calls from 50 citizens who say they witnessed the UFO and that the number and credibility of the people is exceptional. The rural Texas town has attracted worldwide attention after the sightings. The Stephenville Empire-Tribune, the local newspaper, has received calls from as far away as Finland and Japan as people remain fascinated about the reports of a bright object in the sky that witnesses say was a mile long. It remains the talk of the town and the Stephenville High School Science Club is now selling T-shirts to cash in on the craze. Stephenville prides itself on being the dairy capital of Texas and the shirts that sell for $10 have a picture of a Holstein cow being beamed up to a flying saucer. More than 30 residents of Stephenville, Texas, claim to have seen a UFO, described as a mile-wide, silent object with bright lights, flying low and fast. And now it's actual front-page news. So what was it? "It was very intense, bright lights," said local newspaper reporter Angela Joyner. "The lights were like going like this," said Constable Leroy Gateman making hand gestures to describe what he saw when he spotted the UFO. Rick Sorrells says he saw it while he was hunting deer in the woods. "You look at the trees, and it was right here," Sorrells told ABC News correspondent Mike Von Fremd as he showed him the location in the woods where he spotted the UFO. Steve Allen, a 50-year-old pilot, was at a campfire with friends and says the object was a mile long and half a mile wide. "I don't know if it was a biblical experience or somebody from a different universe or whatever but it was definitely not from around these parts," Allen said. Allen drew a sketch of the object, which he said traveled at amazing speed without making a sound. While drawing, Allen told Von Fremd that he saw "an arch shape converted in a vertical shape, and then it split and made two of them, and then these turned into just fire and it was gone." A spokesman for the 301st Fighter Wing in Fort Worth says no aircraft from his base was in the area, and says the objects may have been an illusion caused by two commercial airplanes. But those who saw the lights don't buy that explanation. "It's an unidentified flying object," insisted a former Air Force technician. "It was so fast I couldn't track it with my binoculars," said Gateman. 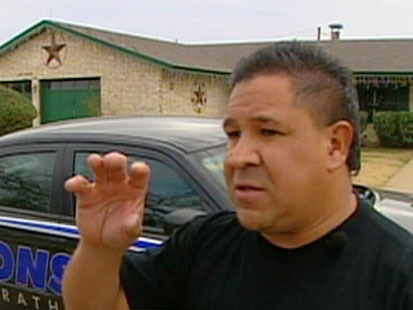 Constable Leroy Gateman describes what he saw in the sky. Some in Stephenville are a bit embarrassed about all the attention. "It's crazy," said one teenage girl in town. "A lot of folks aren't used to this kind of thing. They are not UFO nuts or anything like that around here," said City Councilman Mark Murphy. Like it or not, all eyes are now trained on the sky over Stephenville to see whether any mysterious flying objects return.